LILIN have laid claim that they were the first company in the World to introduce ONVIF compliant products and have focused recently on IP video solutions rather than analogue and they have now become the first to introduce HD camera kits over IP. The migration from analogue to IP is simple with LILIN because many of the form factors, installation methods and menus have not changed. Their experience in CCTV has taught them how to make IP Products that are easy to install and easy to operate. The LILIN product line ranges from megapixel cameras, hybrid digital video recorders to standalone encoders and network digital recorders. So what is in the HD camera kits? Well the basic HD camera kits contain 4 HD IP cameras, 4 power supplies a 16 channel NVR software that are provided within the kit with no licence fees needed. The software is expandable and up to 36 channels can be unlocked if required. The software has an extensive range of features including EPOS connectivity and face detection. This is above and beyond the usual functions you would expect such as alarm management and advanced search features. 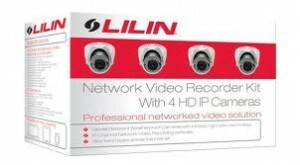 In addition iPhone, iPad, Blackberry and Android connectivity mean that these HD camera kits are looking like very desirable products, however what price would you expect to pay for HD camera kits from LILIN ? Well the NVR-kit112 that contains 4 internal HD dome cameras is £620. The NVR-kit12 consists of weatherproof HD IR cameras and costs £633. Finally NVR-kit312 consists of vandal proof HD IR dome cameras and will cost £816. The above prices are subject to change depending on supplier however the HD camera kits are now available to buy here in the UK and this first step towards providing HD in kit form means HD is now within reach of just about anyone who wishes to upgrade to HD. This entry was posted on Monday, February 6th, 2012 at 20:23	and is filed under HDCCTV, IP cameras. You can follow any responses to this entry through the RSS 2.0 feed. Both comments and pings are currently closed.